The Siemens SITRANS LR200 is a 2-wire, 6 GHz pulse radar level transmitter for continuous monitoring of liquids and slurries. It is designed to be operated in storage and process vessels at high temperatures and pressures, to a range of 20m. The SITRANS LR200’s unique design allows safe and simple programming without having to open the instrument’s lid, utilising the Intrinsically Safe handheld programmer. It also features a built-in alphanumeric display in four languages. The transmitter’s standard Uni-Construction polypropylene rod antenna offers excellent chemical resistance and is hermetically sealed. The Uni-Construction antenna features an internal, integrated shield that eliminates vessel nozzle interference. Start-up is easy with as few as two parameters for basic operation. Installation is simplified as the electronics are mounted on a rotating head that swivels, allowing the instrument to line up with conduit or wiring connections or simply to adjust the position for easy viewing. The SITRANS LR200 features patented Process Intelligence signal-processing technology for superior reliability. 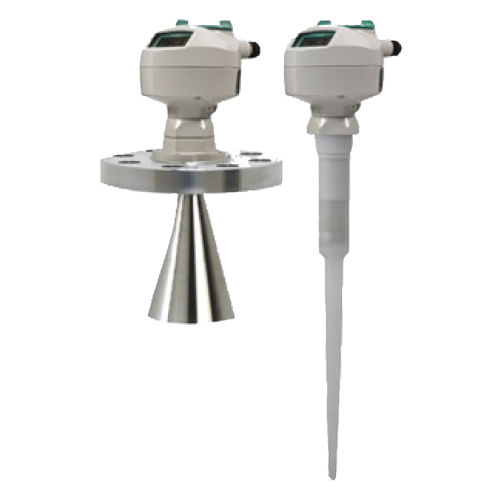 The SITRANS LR200 is a 2-wire 25 GHz pulse radar level transmitter for continuous monitoring of solids in storage vessels including extreme levels of dust and high temperatures, to a range of 30 m.